Two groups of protesters, one denouncing President Donald Trump and the other praising him, gathered at Austin City Hall and marched through the streets of downtown Saturday afternoon. The protest originally began as a rally hosted by Refuse Fascism, a national organization that has spent months preparing a series of protests condemning what it calls the “Trump/Pence regime.” According to the organizers of the protest, Refuse Fascism also hosted dozens of similar protests across the nation Saturday in cities ranging from Los Angeles to New York City. 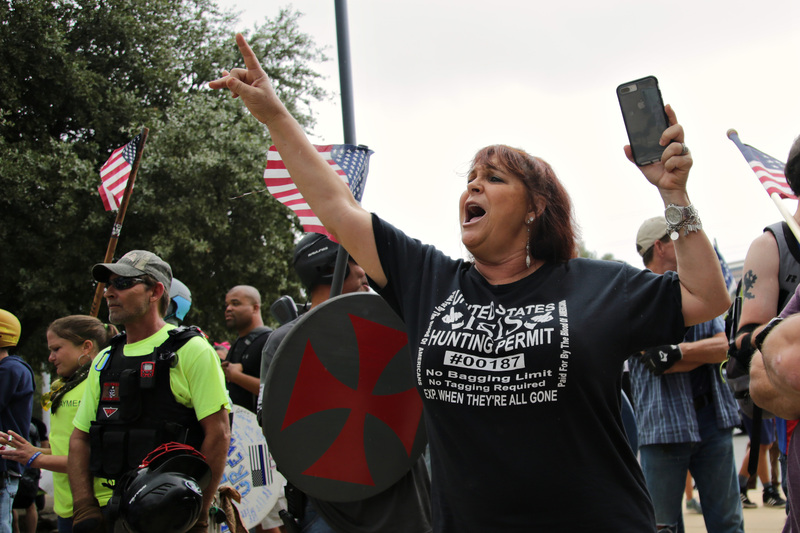 To the surprise of its organizers, the Refuse Fascism protest in Austin was quickly overwhelmed by counterprotesters — some armed — who outnumbered them three to one. Barazoria, TX resident Vickie Williams counter protests at an anti-fascist demonstration in front of city hall on Saturday afternoon. Matthew Williams, a pro-Trump protester from Houston, said he had been following Refuse Fascism online for several weeks. Williams called the Refuse Fascism protest “crap” and said it was doing little more than inconveniencing Austin drivers and the police. “This just shows you that the American people support Trump,” Williams said of the high number of Trump supporters at the rally. At first, the two groups remained separated by Cesar Chavez Street. The Refuse Fascism protesters gathered on the grounds in front of City Hall, and the counterprotesters were scattered, but one large group coalesced across the street near the First Street Bridge. Refuse Fascism protesters wore shirts that said “No!” and held a large sign declaring the need to end the “Trump/Pence Regime,” while the other side wore military-style gear, Confederate memorabilia and carried American flags. Soon after the protest’s official start time of 1 p.m., the counterprotesters made their way across the street. Within minutes, the two groups converged just inches away from one another in front of City Hall. The Refuse Fascism side led with chants of “humanity first” while the counterprotesters yelled “U.S.A.” repeatedly. Police officers barged into the crowd and separated them, forming a human barricade of officers and their bikes. The wall did little to calm either side, and the protest rapidly devolved into a shouting match between the two groups. As Refuse Fascism protesters took turns giving speeches declaring various grievances against the president, the counterprotesters yelled over them and made fun of the original group’s small size, saying it showed how little support they actually had. Design freshman Samantha Sturgeon said she stumbled upon the protest during her lunch break from work. Seeing the low number of protesters for Refuse Fascism, she said she decided to stay and march with them in support. Sturgeon said this was one of the most intense protests she has seen. When the City of Dallas took down Confederate monuments in August, Sturgeon said she attended, but the opposing groups of protesters were kept hundreds of yards apart — not less than a dozen feet away from each other. Shortly after 2 p.m., the Refuse Fascism protesters began marching through downtown to Republic Square Park. Police officers marched alongside, using their bikes to form a moving barricade to keep the counterprotesters at bay. Occasionally, the Trump supporters would break through the wall of officers, only to be quickly forced back onto the sidewalk and out of the street where the original protesters marched. A woman watches anti-fascist protestors and counter protestors march in downtown Austin on Saturday afternoon. One Refuse Fascism protester marched with a papier-mache copy of the president over his head, and a counterprotester carried his own copy of Trump, a cardboard cutout of the president. Instead of stopping at the park, however, the protest turned and went back toward City Hall. Refuse Fascism protester Whammy Birt said it was because they had concerns about security. The park was wide-open, and Birt said they were worried about the ability of the police officers to protect them in such a large area. After making a five-block circle through downtown and passing by the park once again, the protesters made their way back to City Hall. Police officers reformed their initial barricade with Refuse Fascism protesters next to City Hall and the counterprotesters backed up to the street. By this time, the rally had dwindled and protesters on both sides began to leave. Das said this protest was just one of several to come over the course of the next few weeks. Along with planned rallies on Nov. 11 and 18, Das said they are encouraging pop-up rallies around the city on Nov. 8, the anniversary of the 2016 election.